Please add profiles for those who died as a result of Influenza between 1968-1969. As in 1957, a new influenza pandemic arose in Southeast Asia and acquired the sobriquet Hong Kong influenza on the basis of the site of its emergence to western attention. Once again, the daily press sounded the alarm with a brief report of a large Hong Kong epidemic in the Times of London. A decade after the 1957 pandemic, epidemiologic communication with mainland China was even less efficient than it had been earlier. As this epidemic progressed, initially throughout Asia, important differences in the pattern of illness and death were noted. In Japan, epidemics were small, scattered, and desultory until the end of 1968. Most striking was the high illness and death rates in the United States following introduction of the virus on the West Coast. This experience stood in contrast with the experience in western Europe, including the United Kingdom, in which increased illness occurred in the absence of increased death rates in 1968–1969 and increased death rates were not seen until the following year of the pandemic. 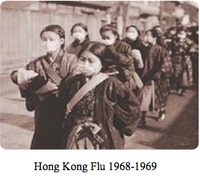 The Hong Kong flu virus was similar in some ways to the 1957 pandemic flu virus. This might have provided some immunity against the Hong Kong flu virus. The Hong Kong flu virus hit in December of 1968, when school children were on vacation. This caused a decline in flu cases because children were not at school to infect one another. This also prevented it from spreading into their homes. Improved medical care and antibiotics that are more effective for secondary bacterial infections were available for those who became ill. In 1968 a new Influenza A strain emerged from Asia. The virus (H3N2) reached the United States in September 1968, peaking in the winter months. Due to delays in developing a vaccine, very few US citizens were protected against illness. About 34,000 people died in the United States during this pandemic.